An Arts For All meeting was recently held at Hastings City Art Gallery. 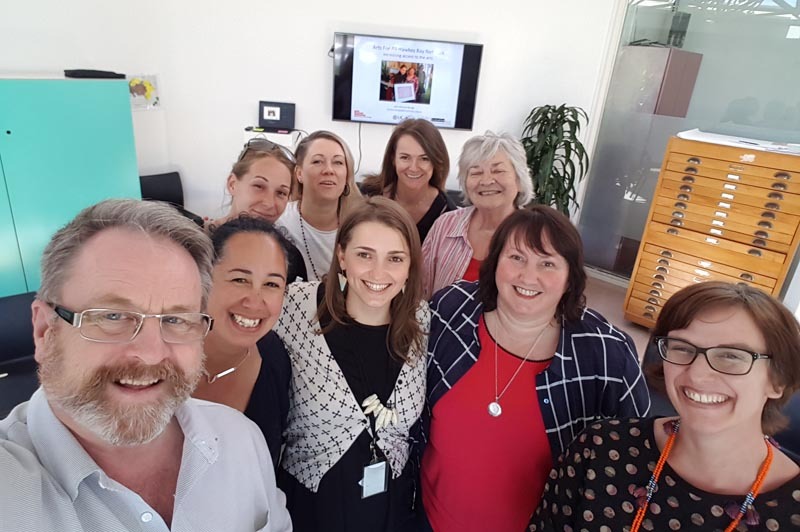 Along with three other staff from MTG Hawke’s Bay, I attended this meeting, led by Richard Benge from Arts Access Aotearoa. Richard introduced the Arts For All Network – a programme aimed at encouraging museums, galleries, theatres, festivals etc to improve their accessibility for disabled audiences. 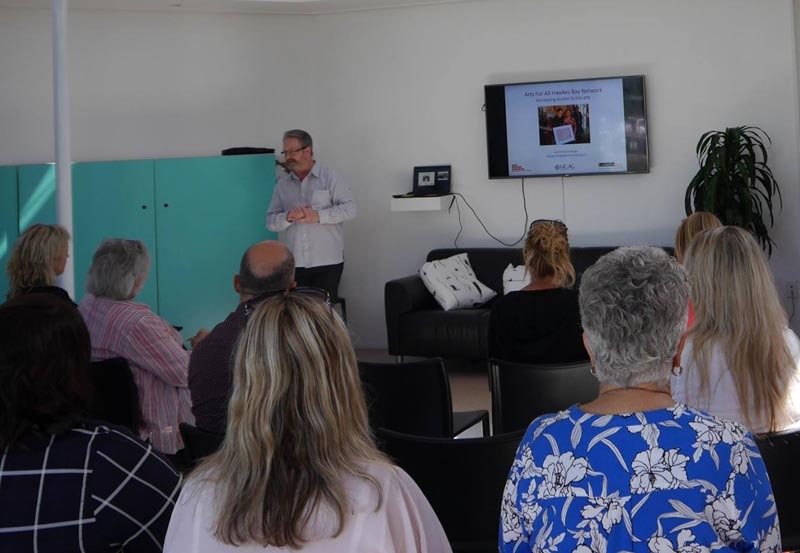 There was a small, enthusiastic group of people from various organisations at this first Arts For All Network meeting in Hawke’s Bay, all keen on looking at ways to make their organisation more accessible for everyone. At the same time, we’ve recently had an Accessibility Audit done on MTG to look at how well the building does, and doesn’t, work to enable easy physical access into and around the facility. This report, along with staff ideas and observations, and the Arts For All Network meeting, has highlighted a number of things we can do to improve our accessibility. There are some things we can’t change such as the display cases in stairwells although we can look at how we make images and information about the items displayed there easier to access. But there are a number of things we can do, some quick and easy, while others will take more time, thought and resource. For example, there have been ongoing discussions since I came to MTG regarding font size on labels and, while we are generally much better, we’re not quite there yet. We’re going to get the doors leading to accessible toilets modified to make them easier to use. And we’ve nearly completely work on adding captions to the Survivors’ Stories film. This will make the film, which is incredibly popular with our visitors, much more accessible for people with hearing impairment and for those with English as a second (or third) language. It’s such a great film – we want to make sure no-one misses out. We’re also looking at how we plan exhibitions and activities to allow sufficient time to ensure captions are included in all future videos or film in our galleries. With the library coming to join us at MTG for a few years, this has opened up the opportunity to look at better access to the Century Theatre foyer. And the Council is currently investigating whether a ramp can be installed on Herschell Street – up to the deck outside the Century Theatre foyer. At the same time, they’re looking at additional accessible carparks around the museum building. We’ve long been aware of issues regarding wayfinding at MTG. These include helping people find access into the building without climbing stairs; where the accessible toilets are; where the lifts are; and how to access additional help if required: for example, a wheelchair or assistance from staff. All of these are things we’re actively working on in the hope that every action, no matter how small, can make things a little bit easier for our users and ensure everyone in the community is able to access their museum. There’s much more we can do and will do over time to make the museum as welcoming and inclusive as possible. Future plans will include activities such as signed tours, touch tours and autism-friendly programming. As always thoughts and ideas from the community about this, or any other matters, are welcome. 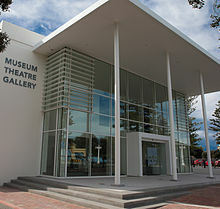 Laura Vodanovich is the Director of the Museum Theatre Gallery (MTG) Hawke's Bay. This column was printed first in the Hawke’s Bay Today. Original generation time 1.6598 seconds.